Hyderabad: With complaints pouring in from all quarters over poor functioning of LED streetlights, the Greater Hyderabad Municipal Corporation (GHMC) conducted a survey to identify defunct lights and replaced them with new ones to ensure 98 per cent glowing rate. 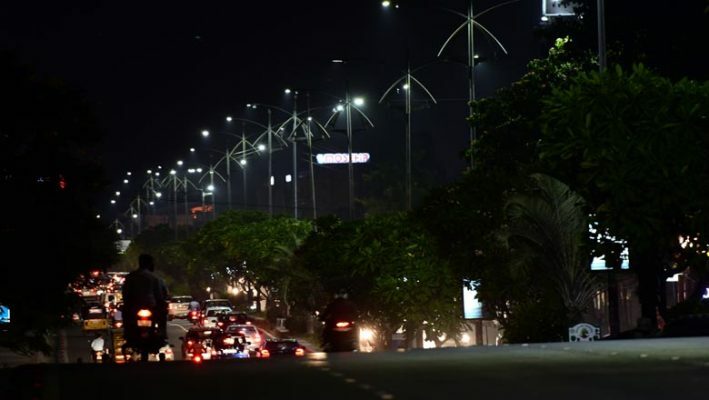 There are over 4.19 lakh streetlights in GHMC limits and Municipal Commissioner M Dana Kishore instructed officials to submit a report on the glowing rate of the lights after complaints by corporators during the standing committee meeting held last week. Accordingly, officials in association with Energy Efficiency Services Limited (EESL) conducted a survey and identified 20,450 defunct streetlights. All these were replaced with new ones, besides fixing the snags in the lines, switches and spares. This apart, 26,000 streetlights were randomly picked up to be monitored under the command control switch system. Of these, 25,860 were found to be functioning properly. The same was also checked with elected public representatives in different areas, and GHMC officials also obtained their certification over the functioning of streetlights. The GHMC took up the biggest exercise of replacing over 4.19 lakh conventional streetlights in the city with LED ones in association with EESL in July 2017. This helped the corporation save 162.15 million units power a year, facilitating saving of 115.13 crore in power bills. More importantly, this exercise helped GHMC reduce carbon dioxide emission by 1,29,719 tonnes annually, said a press release. In addition to this, the GHMC has now facilitated residents to check the functioning of streetlights through the command control system. Residents can check the glowing percentage of streetlights at CCMS dashboard http://120.138.9.117:8080/ghmc. Residents can also lodge complaints, if any, over toll-free number 18001803580 or email helpline@eesl.co.in or log on to http://support.eeslindia.org website.